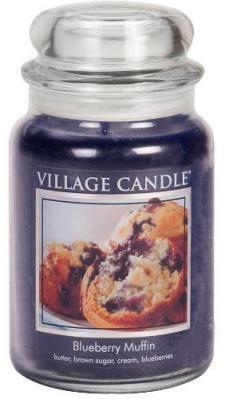 Blueberry Muffin - Village Candle - Candle Find ... the site for candle lovers! Blueberry Muffin is generally a fragrance I tend to enjoy. Who doesn’t like warm cake/bread notes blended with sweet blueberries? Okay, maybe not everyone but I sure do! 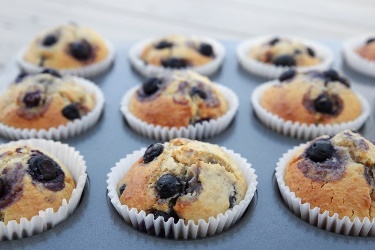 This fragrance of fresh-from-the-oven, blueberry muffins will wake you up on the right side of the bed. Butter, brown sugar, fresh cream and blueberries come together in a true rendition of this classic blueberry treat. Reading that description, that sounds pretty darn delicious. Thirty different reviews on Village Candle’s website indicates all those that have tried it – loved it! So I have high hopes! Smelling the wax, I smelled a sugary blueberry scent. Not very cake-like but still delicious nonetheless. Hoping the warm bread notes come to life once burning. I lit my Blueberry Muffin candle in a medium size room to start out and a few hours in, ended up moving it to a smaller room. I’m always after strength and a small room gave me what I wanted with this candle. Once moved, the sweet aroma of blueberries, sugar and a hint of bakery filled my guest bathroom. I wouldn’t call this the most authentic blueberry muffin since it lacked more bread/cake notes but it was still pretty delicious. A sweet blueberry with creamy hints of vanilla. Strength – I would rate Blueberry Muffin from Village Candle a 7 out of 10 in a small room. Not super strong but decent. How did my Blueberry Muffin candle burn? This candle burned perfect! Zero wick issues. Clean burning from beginning to end. I still watched the candle but didn’t have to trim the wicks at all. Loved that! Blueberry Muffin from Village Candle was a nice and sweet blueberry scent with lots of sugar and creamy hints of bakery. An authentic blueberry Muffin? I could see how some would say yes but to me, this was more of a blueberry and vanilla. My opinion. I purchased Blueberry Muffin on sale and will continue to watch for sales from Village Candle. That’s definitely the time to buy.